These almost look like two different images. 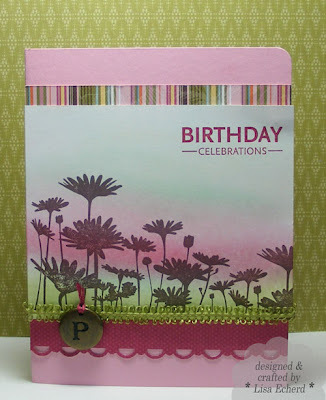 Yet, they are the same stamped image - Upsy Daisy from Stampin' Up! background colored with pastels. The one on the left is a lot bolder than the subtle look on the right. Must have used very different pastels? Nope. The one on the right does have a tiny bit of barely banana. Otherwise, nothing different on the pastels. The bold look on the left is created by embossing the daisies in a dark color; that's it. The one on the right has the daisies stamped in Versamark and embossed in white. When you go over the white image with the same pastels, they just look far lighter. In the sample on the left above, the chocolate chip has been stamped with Chococlate Chip craft ink and then embossed. In the card below, I just stamped the daisies in Chocolate Chip classic ink and then went right over them with the pastels - no embossing. Note: I also tried this with Basic Black and it smeared. I don't know why the chocolate worked and the black didn't but that was my experience. This was supposed to be a Sympathy card but it came out far too bold for sympathy. The subtle version above was too light for the pattern paper so in true papercrafting style, I adjusted. It is now a birthday card with the recipients initial attached. I've had that cute little green trim for awhile. I think it came from Stamper's Alley in Mooresville, NC. They have great ribbons at very fair prices. if your look is too light or too dark, consider changing the stamped image color rather than the pastels for different effects. One other note about this card, the daisies are stamped twice. First, lined up on the left edge of the 4 1/4" wide cardstock. 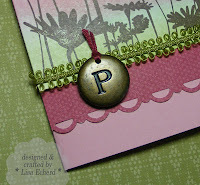 Then I stamped again on the right side to fill out the design. I just brought the daisies down so that I was only using the very top of the image so it looks like the image is a full card width wide. No wonder this great image is so popular. Ingredients: Stamps: Upsy Daisy by SU!